I Am A Magazine (IAAM) was a large-scale, complex project involving hundreds of staff and students from across Middlesex University’s Faculty of Arts and Creative Industries. It took place in early January 2017. Students from a range of subject areas including Fine Art, Graphic Design, Fashion Communication & Styling, Photography, Theatre Arts (and more) came together for this inter-disciplinary project. Magazines are a rich research resource for students. They combine text with images, layout and format; they are a physical and tangible material medium, which is still relevant in an age of digital natives. Print magazines remain a mainstay of contemporary material and visual culture. Magazines are interesting and relevant because they are simultaneously so ubiquitous and so ephemeral that they are often overlooked as objects of serious enquiry. Together MoDA and Middlesex University’s library have around more than 450 magazine titles, from Practical householder, to Visionaire. We wanted to draw these important resources to students’ attention and encourage them to critically analyse them as powerful cultural artefacts. This was the first time magazine were brought together in one large scale project. I Am A Magazine aimed to provide the space and opportunity for disciplines to collide, mix and interweave. The brief was to critically examine magazines in Middlesex University’s magazine collections (drawn from MoDA and the Special Collections in the Sheppard Library). The magazines were a springboard to create new work: students were asked to respond to their content, iconography, discourse and materiality and to the wider context of magazines as communicative tools, as creators of communities and culture. We were not expecting students to produce a magazine; we wanted them to generate an outcome of their choice through discussion with their peers, by following a ‘design sprint’ model, which was outlined in the brief. 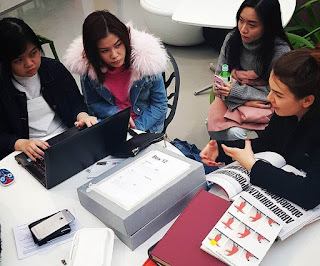 The work that the groups generated was exhibited in Middlesex University’s Grove Atrium, with a private view on the Friday of the project week. The exhibition continued for another week afterwards. What students produced during the project was up to them: outcomes included a stop-frame animation, a period room-set and several photographic pieces. But this was a project in which the process was as important as the product: students were learning skills of team work and negotiation, of working with students, equipment and techniques outside of their usual subject areas. The project was a truly collaborative one for staff as well as students, involving colleagues from MoDA, Library and Student Support and the Faculty of Arts and Creative Industries. Posted in #Co-Creation, #Fashion/Craft, #FineArt, #Magazines, #MDXstudents by Zoe Hendon on January 18th, 2017.